Cards back in first by themselves. Thanks Jerry Meals! Edwin Jackson and Mark Teahen to Toronto for Jason Frasor and a prospect. Speculation that Jackson is going to St. Louis along with another piece or two for Rasmus. Dang. I was hoping the Dbacks could package something for Frasor. Edwin Jackson is the guy who just can't stick. So far, I count the Rays, Dodgers, Dbacks, White Sox, Tigers and now the Blue Jays as teams he's played for in his short career. I think this will be one of several White Sox trades. I know they're not out of the Central race, but this group has been wildly inconsistent this year. The best news today is they are finally benching Rios. He had a solid 2010, but has been putrid this year. Blue Jays fans can relate I'm sure. I wouldn't be surprised if Quentin gets shipped out for prospects. I also wouldn't be shocked if Buerhle or Floyd get moved either. Same goes for Thornton. Hopefully Viciedo gets called up now that Teahen's off the roster. Sounds like the Giants are about to get Beltran. Buster Olney tweeted that the Rays offered one of Jeff Neimann, Wade Davis, and Alex Cobb to the Cards for Rasmus. Rasmus goes to Toronto for Jackson in 8 player deal. The trade: Colby Rasmus, Trever Miller, Brian Tallet and P.J. Walters for Jackson, Marc Rzepczynski, Dotel and Corey Patterson. Getting rid of Teahen's contract is a big win. If Cooper can get anything out of Zach Stewart it will be a bonus. Rumor is that the Giants top pitching prospect Zach Wheeler is the return for Carlos Beltran. Great trade by the Mets if that is the case. I won't bash the Giants too much if they are able to resign Beltran or he helps them repeat as WS champions. Damn. I don't want to see the Giants getting any more offense. Seems like the Dbacks finally caught a break last night since they won and the Giants lost. They have been trading wins/losses for the past few weeks it seems. Yeah but a 7-game lead on the Braves is better than 6. Thanks for nothing, Meals. Last edited by Maxflier; 07-27-11 at 01:49 PM. 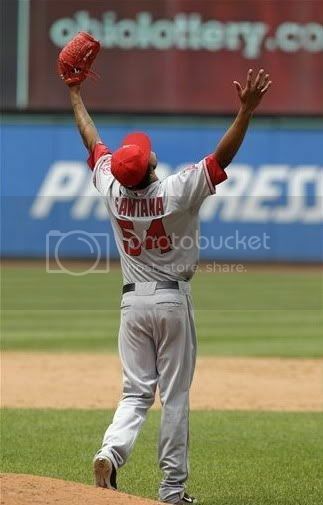 Ervin Santana nohitter vs the Indians winning 3-1. Congrats! Phil Hughes seemed to pitch an ugly 6 innings. Only 2 runs given up in 6 innings but 10 baserunners is a hell of a lot. However the 2 runs is good and if he wasn't up against King Felix he'd probably be in line for the win instead of another loss. But good for Seattle for finally breaking into the win column again. Any more? We don't have any to begin with! That said, I hope we end up with Beltran. I've always liked him. Seems like a done deal. Mets get Zach Wheeler. Giants get Beltran and $4 million. Only thing that could hold it up now is if Beltran nixes the deal. I don't see that happening and I say the deal is completed in the next 24 hours. Big deal for the Giants. Good job by the Mets for getting a good prospect in return. If that happens, it's a good deal for the Mets, there's no guarantees with pitching prospects but that's probably as good as they could have done. Beltran also has a clause in his contract where he can't be offered arbitration - which means when he becomes a free agent at the end of the year, the team he's leaving won't get any draft pick compensation (which hurt his trade value some). hell yea! Giants can maybe average 4 runs a game! Last week, I initially didn't like the idea of trading away prospects for Beltran. But then I heard someone say on the radio, "Flags fly forever"
C Beltran doubled to left. A Huff struck out swinging. C Ross grounded out to third. E Whiteside struck out looking.